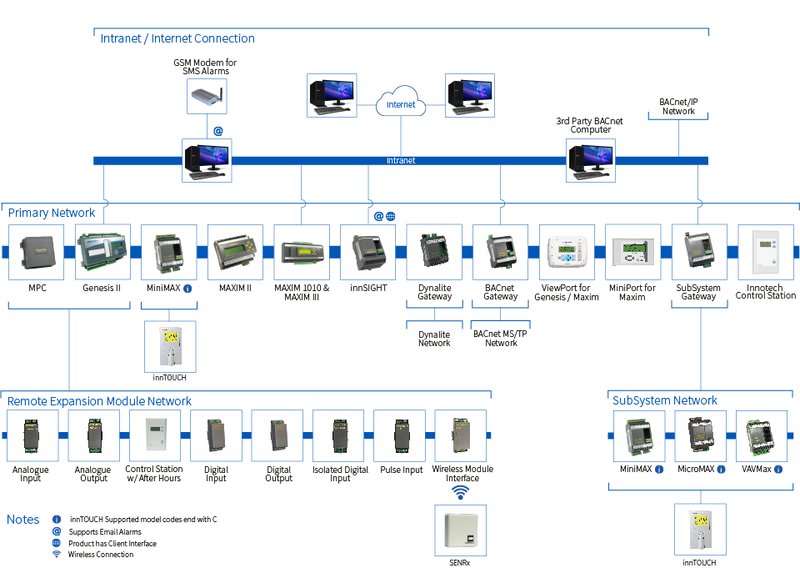 The Innotech Building Management System (BMS) uses a tiered architecture made up of various networks with flexibility to suit all types of applications. When a computer is not needed, innSIGHT (a hardware BMS web-server) may be used instead. innSIGHT allows BMS functionality over an intranet or internet connection from any connected computer. innSIGHT supports up to 128 devices and includes monitoring and control, automatic graphic population, email notifications and alarm indication, as well as real-time trending, extraction of log data and graphing, supporting up to 5 concurrent users. Connecting the Innotech network to a computer network (Intranet) is simple via a dedicated Ethernet converter or Ethernet enabled device. Once connected to a client’s intranet, a dedicated Internet modem, or existing internet connection can be used to access the Innotech BMS. Note, an internet connection can be connected directly to the Innotech Ethernet enabled device without a dedicated BMS computer. The Primary Network consists of a 4-wire RS485 communications bus with a dedicated network for computer connection, and another network to globally share data between controllers. A primary network can host up to 128 devices by using an Innotech dual channel repeating device. The Genesis series controllers are expandable by use of Remote Expansion Modules (REMs). Each Genesis controller may be expanded with up to 15 REM’s (135 points max). The REM network consists of a 2-wire RS485 communications bus that allows the REM’s to be located adjacent the controller, or remotely in the field. The Sub-System Network consists of a 2-wire RS485 communications bus, connected through a Sub-System Gateway (SSG) to the primary network. Each SSG can host up to 63 devices by using a single channel repeating device. The SSG also enhances the capabilities of all connected subnet devices. innTOUCH is a dedicated Smart Sensor for various compatible primary and sub-net controllers. Each compatible controller is equipped with a dedicated 2-wire Power/Comms communications channel. Various innTOUCH models are available to further enhance the connected controller’s capabilities. Various Maxim & Genesis primary network devices have optional HMIs. A Viewport and Miniport are a networkable HMI that allow viewing of all connected controllers. The Miniport is used to view any Maxim controllers, where the Viewport may be used with both Maxim and Genesis controller applications. The Innotech BMS solution has the flexibility to be ultra-competitive for small, medium and large projects. The wide range of products caters for basic OEM applications, through to multi-story, or site wide projects like Government Facilities, Hospitals and Education Institutions. The ease of programming and commissioning of controllers, BMS Graphics, Energy Management Software and Integration, can save up to 40% on the total project costs. No ongoing licensing fees, with superior quality and reliability also guarantees minimal service and maintenance costs, which is a great outcome for any ongoing client relationships. Contact us or find your local Innotech representative to learn more.